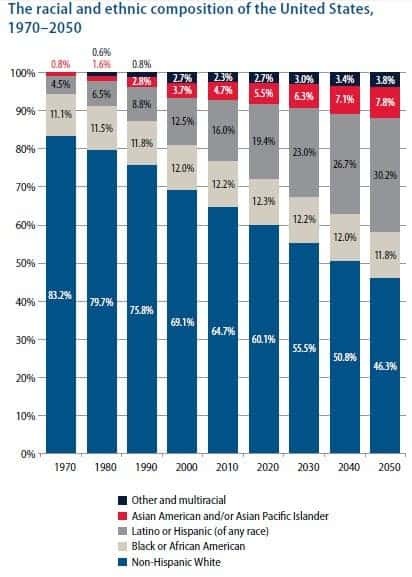 According to a recent research published by Policylink, an US research institute which aims ‘to advance economic and social equity’ in the nation, the majority of the American population in 2050 will be of color. In the report, dubbed Prosperity 2050, the authors outline how the startling increase in discrepancies between wealth and social status between demographics could pose dire consequences in the future for the nation. To better illustrate their point, the paper’s authors collaborated with the USC Program for Environmental and Regional Equity and released a time-lapse map, showing the country’s rapidly changing demographics, in which they predict that by 2042 “people of color will be the new Majority“. The time-lapse map can be viewed below. Other aspects covered in the publication are “Promoting Growth Through Equity”, “Rising Productivity, Stagnant Wages”, “Growing Wealth Gap”, among others. It’s a good read, which I recommend.